The choir is led by our very capable music team, Musical Director Jules Addison, and Accompanist Lorraine Wild. Jules Addison’s musical education started around the age of 3 when he started to play on an old Hammond organ in the family home. At the time before any formal musical training he couldn’t read music so just played by ear. Jules first started taking piano lessons from the age of 6 and was soon working his way through the ABRSM syllabus. Studying with David Rees Williams at school he achieved Grade 8 on the organ and piano by the time he was 15. He then furthered his organ studies at Royal Holloway, University of London with Jeremy Filsell whilst studying for a Music Degree. After graduating in 1996, Jules embarked on a career in the music industry focussing on teaching and music production. From this time forward, choirs and choral music became very important influences on Jules’ career. He has a passion for teaching music and particularly for helping others to make music together. In 2004, Jules set up 4 Part Music to offer professional mobile recording services to choirs and schools across the UK. Alongside his recording business, Jules now has a thriving teaching business working both from his home studio as well as travelling to pupils in the local area. He also directs an ever increasing number of choirs in Wiltshire and the surrounding areas with the emphasis on bringing people together to sing. 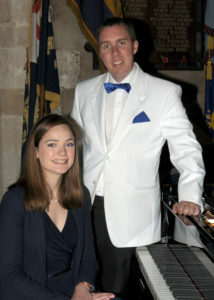 Jules was appointed Musical Director of the Cirencester Male Voice Choir in 2014. Further information on Jules is available at: www.julesaddison.co.uk. Lorraine developed a passion for the piano at a young age and started her studies at the Conservatoire of Besançon (France). In 2008, she achieved a first class honours diploma in piano performance at the Conservatoire of Dijon (Burgundy, France), studying with the pianist Thierry Rosbach, as well as composition, musical analysis and chamber music. After graduating from the University of Paris-IV Sorbonne, in ‘Music and Musicology’, Lorraine continued her studies at the University of Leeds. Achieving Merits in her Masters Degree in Piano Performance under the guidance of Ian Buckle, she won twice the University of Leeds Piano Competition in 2013 and 2014. Lorraine is passionate about pedagogy and completed a Postgraduate Certificate in Performing Arts at the Guildhall School of Music and Drama in London in 2018, graduating with distinctions. Lorraine is currently the main accompanist and piano teacher at Westonbirt schools (Gloucestershire). She was appointed repetitieur to Cirencester Male Voice Choir in May 2017.